As I write this, it’s 4 a.m. on a Sunday morning. Wondering what’s keeping me up at night? (Technically, it’s morning, but it feels like the middle of the night.) If I had to guess, it’s probably the same thing that keeps many of you up when sleepless nights are work-related: customer success. You likely call it “student success.” To me, that’s the same as customer success. 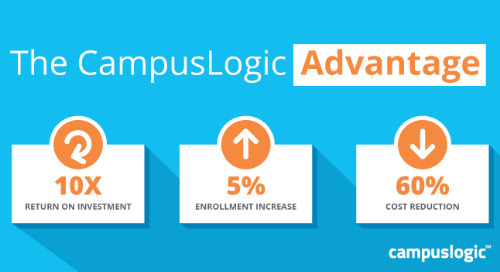 At CampusLogic, our purpose is to “help schools change lives.” We believe that when we make our customers successful, their students will be successful. That’s what drives every decision; the reason we’re so passionate about our work. It’s also the thing that keeps us up at night—wondering if we’re doing the right thing, if there’s something we could be doing better, or how to make the student financial services journey easier. If these things weigh on your mind too, consider my three (insert air quotes) “easy” steps to create more customer success/student success in your office. Why the air quotes? Because defining and implementing these steps will take time. But when you start, and build on it over time, it shouldn’t be too difficult. Create a discipline of holding weekly or biweekly retrospectives with your team. This is part of the Agile methodology for continuous improvement. The purpose of these meetings is to talk about what went well and what didn’t, surface new ideas, and pinpoint where more practice is needed. Retrospectives should be focused on a certain area—or maybe a new process you’ve recently implemented. We give teammates a stack of Post-it® Notes and each person writes their thoughts and sticks them under these categories—what worked, what failed, new ideas, areas for improvement—listed on a whiteboard. Once everyone is finished putting up their notes, we talk through each one—with open, honest, constructive discussion. There are always a few comments that are repeated by several people—and that’s okay. The goal of this exercise is to walk away with two or three solid process improvements to focus on going forward. Having clear goals that can be easily measured will help you keep an eye on what’s most important. But first, you need to figure out what to analyze—and that can be overwhelming. I always try to remember two things: What are the outcomes we’re trying to achieve? What is the behavior we want to establish? They’re the teammates who work behind the scenes, diligently updating ClearCostSMnet price calculators for our customers. Their role requires both attention to detail and time-bound delivery dates. So, setting metrics for them is not as simple as measuring speed of output because we need to measure quality, too. The metrics must, therefore, include both. It’s also important when choosing your metrics that they’re easy to track. When they’re not, guess what happens? We stop tracking them. Metrics give us an objective means to develop a foundation and focus. It’s absolutely worth the time you invest to evaluate the types of metrics that work for you. Wait, did I just say, “be a follower?” Doesn’t that go against everything we believe at CampusLogic? Well, sometimes other people already have stuff figured out. So, why not ask them what they’re doing—and see if it can work for you, too? I’m never too proud to ask what’s working for other people. And I’m happy to use what they have already tested and proved. Sure, I’ll probably adjust it to fit our processes, but I’m always grateful for a good idea from somebody who cares about the same things I do. Building a network of people who share your passion is as important at work as it is in our personal lives. January is a perfect time of year to kick off process improvements—and the use of metrics that will enhance your customer/student success goals. Here’s to an #awesome 2018—with effective retrospectives, metrics that drive the outcomes you want, and a network of people who can support you along the way!